A few weeks ago I was contacted by reader Peter Gasson who mentioned that he had a photographic slide he had taken many years ago. I was very keen to see the photograph and so dropped him a line. I was right to be excited by Peter’s offer, this is a rare glimpse at the blocks that used to sit on Finnis and the western side of Corfield Street. They and the inscription are now lost as the blocks were demolished in the mid 1970s (you can glimpse them along with the inscription in this image). I asked Peter how he came to take the photograph: “I used to live in Highams Park and regularly took the train to Liverpool Street, so I saw Waterlow Buildings from the train and was quite taken with the distinctive Victorian style of the inscription: “Erected by the Improved Industrial Dwellings Company” which I had often seen from the train. One day I got off the train at Bethnal Green and photographed it. 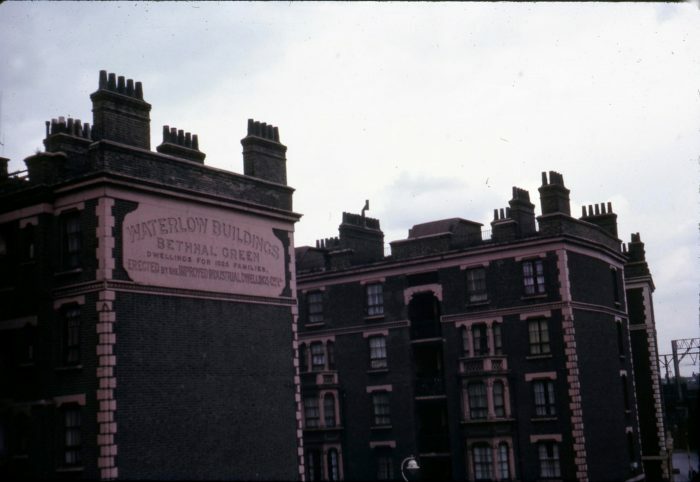 The photo was taken from the platform of Bethnal Green Station. All I knew of Waterlow Buildings was what I could see from the train. As it happens my father was born in the Bethnal Green Road and attended the school in Wilmot Street, but he had moved away during the 1920s. “The photo was taken on Kodachrome. I’d say the colours are fairly accurate, allowing for the fact that – to judge from the sky – it was taken on a dull day. At that date much of inner London, including many of the famous buildings, was still blackened from a century of London soot. Some films of the time bear this out – e.g. The Ipcress File. Cleaning was just starting; I think St Paul’s Cathedral was one of the first of the famous buildings to be cleaned. It is sometimes hard to believe how London looked then compared with today. Recently I took a nostalgia trip on the same line from Liverpool Street to see what had changed. I tried to make out what had happened to Waterlow Buildings and how much had survived, and this was what led me to your website”. Thank you to Peter for taking the time to share his photograph and memories of the buildings as he saw them on his daily commute in the 1960s. I went up to the Bethnal Green Station platform today and took a photograph from roughly the same spot. 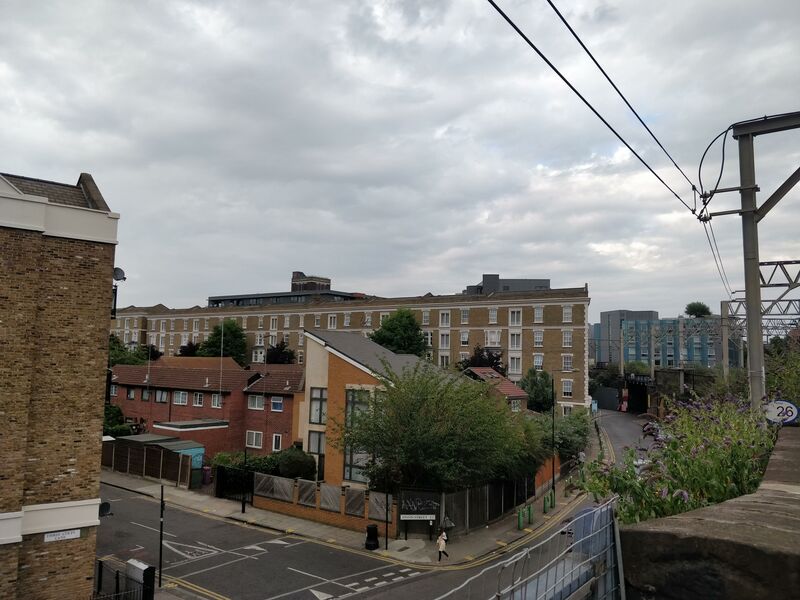 The same view of Finnis Street taken from the platform of Bethnal Green Overground station in 2018. You can see the block on the eastern side of Corfield Street still standing. 15 years ago a local man did some work for me in Wilmot Street and he told me that thiese buildings were called The black buildings’ when he grew up around here. If you look carefully around the windows there are still some very black bricks that dodged Barrett’s clean in the 1980’s. 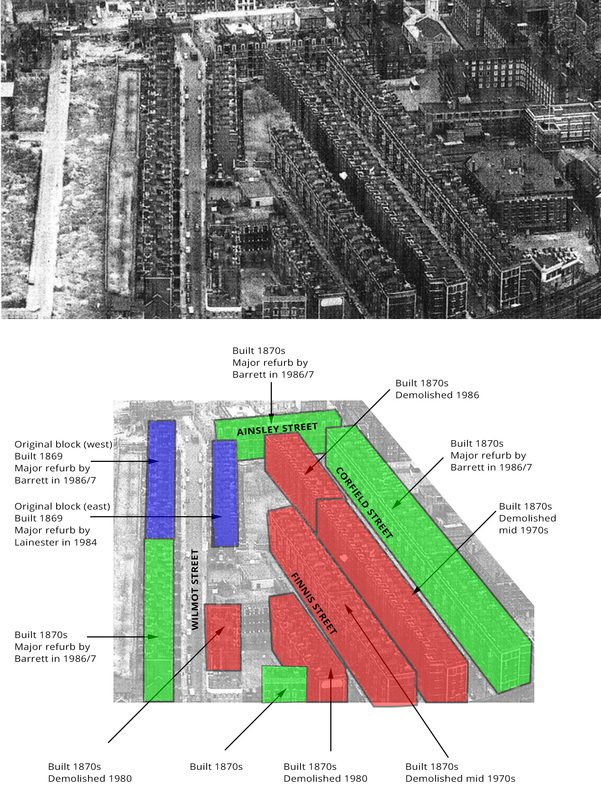 I lived in Ainsley street till 1963, the unit we lived in was inline with Corfield street, so I could look out the window and see the train tracks at the end of Corfield street. Yes I remember everything being black, I use to do a paper round in the smog, my mother made a face mask for me. She also told me there was a gun on the tracks during the war. I lived in Finnis Street from 1959 – 1965 and remember cleaning the dirty smuts from my baby’s face and pillow after leaving him in his pray on the balcony for some “fresh air”!! 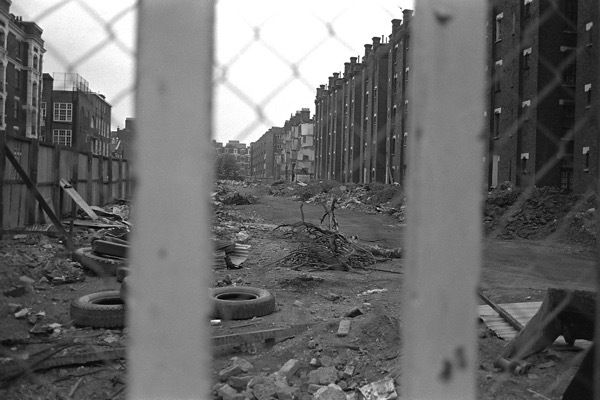 My aunt lived at 21 (I think) Finnis Street until she was rehoused elsewhere in the late 70s. I am overjoyed to find these photos, which bring back so many memories. . Her name was Ray, she was married to Charlie. Life in the flat must have been hard – no bath and an old fashioned toilet and kitchen.Nonetheless, she had good times there – as did I. Occasionally, I was allowed to stay over for a night and she cooked me Vesta Chow Mein – very exotic then to me.